An ex-con bit off a chunk of his boyfriend’s ear during an early morning spat at a Florida residence, according to cops who arrested the accused assailant on a felony domestic battery charge. When St. Petersburg police responded to a 911 call, “there were no witnesses to the incident.” However, Officer Max McDonald reported, "a portion of the victim's left ear was missing." The severed chunk “remained on the ground at the scene of the incident,” added McDonald. Tolbert, seen above, was subsequently arrested for aggravated domestic battery and booked into the Pinellas County jail. He is being held in lieu of $50,000 bond. Tolbert, who works for a seafood wholesaler, has been ordered by a judge to have no contact with the victim. Tolbert’s rap sheet includes multiple arrests and convictions. 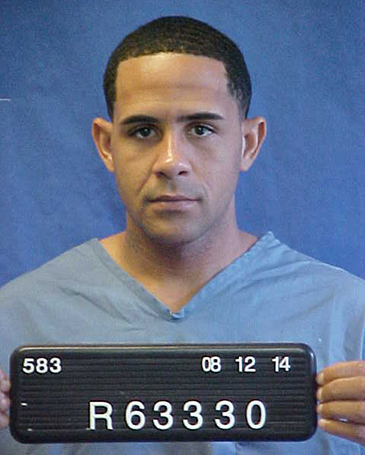 He was released from state prison in October 2014 after serving about seven years in custody for grand theft, robbery, and carjacking.